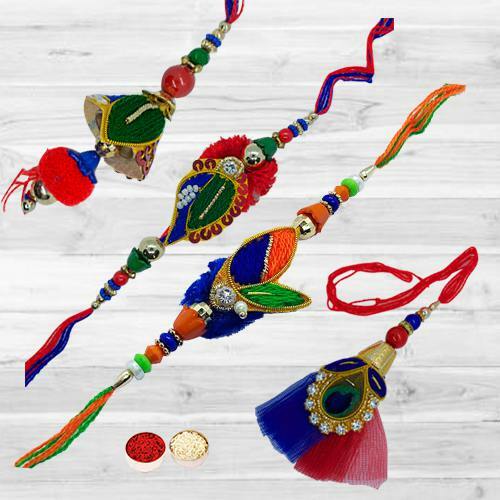 Appropriate for brightening up Raksha Bandhan celebration, this Attractive Colorful Rakhi Set for Bhaiya Bhabhi complemented with a free sacred Rakhi, Roli Tilak and Chawal, will cast a charming spell upon the moment. These are 4 striking Rakhis decorated with Beads, Sitaras, Golden Threads and Sponge. This Rakhi Set is nicely gift wrapped. The Rakhi design may alter.